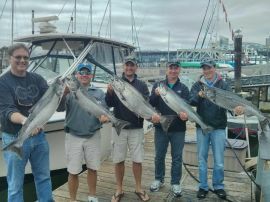 Our half day Vancouver fishing charters are 5 hours in length dock to dock. We generally fish within a 20-minute run of our dock location on Granville Island. An 8 hour charter is perfect for those who want to make a day of it. We recommend 8 hour charters as we can run a little further if we need to and have more time to ensure we catch the bite. A full day charter gives you 10 hours on the water. This charter option is a great way to take full advantage of the day's tide changes. 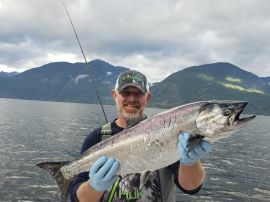 A Full day trip is a great option in May, June, and July when there is consistent Chinook salmon and bottom fishing over on the Gulf Islands. A full day is needed for a Gulf Island trip. *Crab traps are often dropped in the winter and spring. Prawning is possible on our 8 hour winter salmon fishing trips between November and April. We offer Gulf Island bottom fishing charters for rock cod and ling cod in season from May 1st to September 3oth. A 10 hour trip is required. Halibut fishing is available on our multi day trips to the Southern Gulf Island's. Have a look at our fishing packages page. We have some great multi day trips with waterfront accommodation in Vancouver and the Gulf Islands. When fishing with Bon Chovy the boat, the guide, and the fishing equipment are supplied. Boxed lunches can be arranged. Feel free to call 24 hours a day. We will take a credit card number to hold your reservation. We require 48 hours notice if you wish to cancel your day charter without penalty. Charter Rates do not include applicable taxes, fishing licenses, or gratuity. conveniently across the street from the Lobsterman. They sell airplane approved coolers with gel packs. Custom processing options are available through St. Jeans Cannery and the Daily Catch. St. Jeans is only option if you wish to ship internationally.